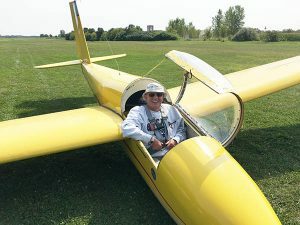 A glider is an aircraft with one or two seats, a fully enclosed cockpit (unlike ultra-lights) and a full complement of directional controls and avionic instrumentation. At Sky Soaring the glider is towed to altitude by a tow plane or launched to over 1200 feet in seconds by our new Tost winch. Soaring is a fun and memorable experience for all types and ages! 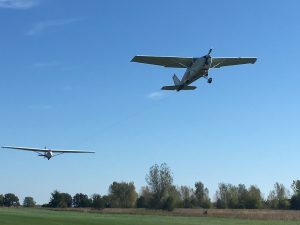 Couples and families enjoy the shared experience of soaring. Student pilots enjoy soaring because it teaches fundamentals of flight with unparalleled clarity. Both experienced and entry level pilots enjoy how economical the sport is compared to powered aircraft. Outdoor enthusiasts of all types (including sailors, climbers, and trekkers) enjoy soaring because it’s a beautiful and exhilarating way to experience nature. High School and college students enjoy the sport because it’s an exciting entry point to the aviation career field. The FAA allows 14 year-olds to fly gliders (with appropriate instruction). Sky Soaring hosts glider flying for the Civil Air Patrol (CAP) program. Glider passengers must be at least 4 feet tall, and less than 220 lbs. Minors require parental presence.